Finally the weather picked up just in time for the long weekend. After a couple of days cooped up in the RV half way up a mountain getting snowed on it was good to get out! This really is such a beautiful part of the state - we took a long ride out north west of Santa Fe - up to Taos area. Lots to see and do along the way! San Francisco de Asis church - it's in some dispute whether this is the oldest or second oldest church in America - either way it's old! A lovely adobe building - the straw is literally crumbling out of the walls with every gust of wind! - But adobe building techniques are not to be sniffed out - it was built in 1815! 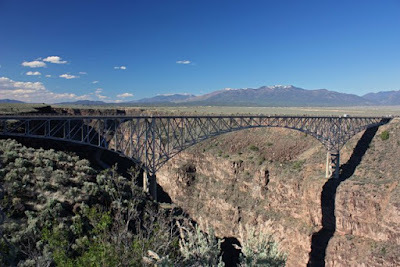 The Rio Grande Gorge Bridge - with incredible views into the river gorge some 650 feet below! The landscape around and approaching the bridge is quite flat and within 1/4 mile of the gorge we still hadn't seen the gorge - then suddenly it opens up like some giant crack in the earth - Amazing views along the gorge with the mountains far off in the distance. 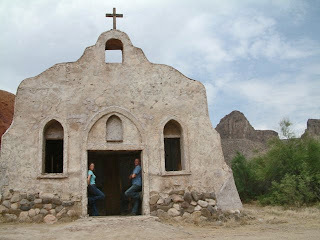 Taos Peublo - was built around 1450 and has been continuosuly inhabitated ever since! It's the largest exisiting multi-storey pueblo structure in the USA and is traditional adobe construction and is home to a fair few ferral dogs following you round and begging for scraps! 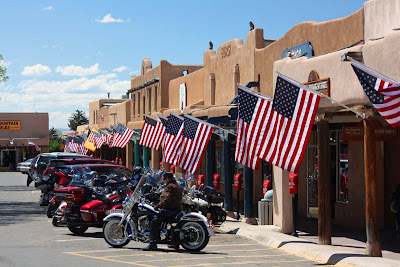 Taos Plaza - we stopped in Taos town for our lunch and listened to the drone of Harley Davidsons going by. Being Memorial Day weekend every man and his pillion rider were out on bikes proudly wearing their Vietnam Vet jackets (did the US Military issue Harleys to their War Vets to see out their days deafening everyone with the noise???) On the up side it was free parking on the plaza and a cheery display of Stars & Stripes flags backlit in the sunshine. Red River - we soon discovered the source of all the Harleys...Bike Week in Red River! The place was heaving. It took about 15 minutes to ride the 1 mile downtown main street. I don't like (the noise of) Harleys (who'd have guessed eh?) BUT they do look good - especially en masse and there was a party atmosphere even just riding through. Took the 'Enchanted Circle' road - 84 mile loop around Wheeler Peak the highest in New Mexico (13,161ft) - still completely snow capped at the moment and by the time we passed by glowing in the last rays of sun. We had such a long ride out - didn't get back till 10pm - 2 hours after sunset by which time it was freezing of course! Just as well the neighbours had a healthy campfire roaring away to sit beside! This morning we said out goodbyes to Nancy and Chris - after nearly a week of having some Brit Rv-ing neighbours they're fast-tracking their way to California whilst we're Arizona bound. We moved further up the hill but back into a site with electricty for the night to recharge our woeful batteries after battering them with an overdose fan heating! Here now in Santa Fe. We're staying in the National Forest just 8 miles away from town but it could be a million miles - we're 1500 feet higher than the city (which is at 7000 feet anyway! ), the air is fresh and clear, we're camped surrounded by pine trees with the most amazing smells and today we woke up to snow!! (actually it was exciting but wasn't really part of the plan!) The high altitude seemed like a great idea when we arrived in town with temperatures in the 90's. Now I'm not so sure....it's a little chilly! It didn't stop us setting off for our daily hikes but the last mile today was a determined hail storm! (nothing like a natural exfoliator!) We ventured briefly into the old centre of Santa Fe but we're here for a few more days and we'll explore more then. Camping next door to us are Nancy and Chris - the other English RV'ers. There's nothing like a good chin-wag around the campfire at night! We have a new camera! Very excited! After a false start on Sunday when we bought the camera orginally, we took it home, played around, and discovered the colour was off - like REALLY off - Chris's new bike was bright pink! After a call to Canon they agreed it was defective. Somewhat frustrating as we were in wilderness 200 miles from the nearest store to get it exchanged. So now...it's sorted. We have our brand new fully functional Canon Digital EOS Rebel XSi!! and very nice it is too. Currently wading our way through the instruction manual. It's a late birthday present from each other and from Pat who gave us birthday money this year towards it - so thank you all! 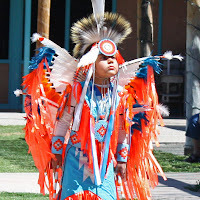 Have just spent a few days in a town called Truth or Consequences. Yes a strange name for a town, but in 1950 they changed their name (previously called Hot Springs) as part of a publicity and fund-raising effort and it's stuck ever since! It was named after a popular game show at the time. From here we took a fantastic ride out on the bike up into the hills and Gila National Forest. The roads were fabulous biking roads through very picturesque scenery. Past the HUGE open mine pit of Santa Rita (the oldest active mine in the SW - it's 1.5 miles wide and 1800ft deep and is producing 300 million lbs of copper a year! ), over the 8228ft high Emory Pass and through a few small (nearly) ghost towns . Stopped for lunch in Silver City - it was a silver mining town, then got lucky and found copper once the silver ran out so now it's still going strong as a funky bonhemian town with every other store an art gallery, a few good cafes, wineries and at least one brewpub that we noticed! The old downtown is full of Victorian brick buildings and a real wild west town feel to the place! A great stop and a cha nce to stretch our legs for a couple of hours. We then took an incredibly twisty road north to the Gila Cliff Dwellings National Monument - the road was actually TOO twisty to be really good fun on the bike - but at least we weren't in a car - the recommended drive time was 2 hours to do 58 miles!! (we did it all in about an hour! - the advantages of a bike on narrow roads - at least we could overtake the slow stuff!) Gila Cliff Dwellings were inhabited about 700 years ago by the Mogollon people - there were a series of 7 caves set up in the cliffs with dwellings built in stone inside them making up some 40 or so individual rooms. Quite fascinating stuff - quite reminiscent of the Cliff dwellings at Mesa Verde, CO we visited a couple of years back but these were very quiet because of their remote location - we only saw 2 other people in the area! We've just spent the last 3 days in Big Bend National Park. Right at the bottom of Texas on the border with Mexico. A very remote and beautiful part of the state. The Rio Grande runs along the edge of park creating a natural border with Mexico. We camped down by the river - the hottest place to be! But the other campsite was up in the Chisos Basin - 5500ft up with a small, twisty and steep road with a bunch of switchbacks to contend with - not a road t hat Harvey could handle! It would've been nice but I don't think we'd have lived to be writing this blog!! Instead we used the bike to get around the park. We did a couple of amazing hikes up in the basin - one out to 'the window' - a gap in the mountains surrounding the basin where you can see out into the surrounding area (slightly spooked at the idea that the trail we used had had a bear sighting only the afternoon before - a bear with 4 cubs no less! - our crazy bear song came into good use once again!! - actually it was a pretty well used trail and we saw a bunch of other people out hiking too) The second hike of the day 'Lost Mine Trail' was way more peaceful - the trailhead had 2 other vehicles parked up and we passed 2 groups of people heading back down within a few minutes of u s setting off so it seemed like a safe bet we were the only ones out on that particular trail that evening. We didn't leave till 6pm so we had gorgeous late afternoon light when we got to the top - just amazing views. Back in the basin we watched sunset - conviently it lines itself up just so with the window!! From the basin we had a 20 mile ride back down to the river campsite and here we were ran the gauntlet of sucidal animals that seem to live in Big Bend. We had near misses with 3 birds (added to the 3 birds that met their maker on the 8x12 foot speeding wall that is Harvey!) We saw 3 deer and then 3 javelinas - which we stopped in good time for but the truck coming the other way wasn't so good on the brakes... and lets just say if Javelinas were pigs then I'd be cooking myself a bacon butty right now! Finally the sucidal Jackrabbit so I seriously don't know how we missed - and by this time we were crawling along at a snails pace after all the near misses!! But besides all the crazy animals there's been a few 'new' animals sightings for us to add to our list! 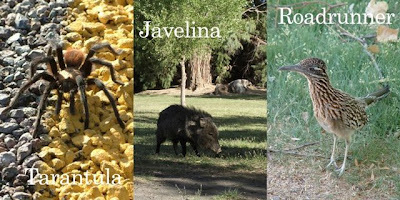 Javelinas (they are NOT pigs!!) and a real live tarantula (not in a zoo!) and though we've seen them before we had a cute little roadrunner hanging around our campsite! The morning we left the winds had come in. Bad for visibility but great for the heat - so much cooler down by the river and we took a nice hike out along the river, through the desert to the Hot Springs. The cooler temperatures made it so much nicer easing yourself into the 100 degree water too of course! Right now we're staying in Terlingua Ghost town - just a few miles outside of the park on the western side. We came here to meet up with a couch-surfer - Cynta. She lives in a beautiful house she'd rebuilt from the ruins of the ghost town (this was an old Mercury mining town which was abandoned in the mid 1940's). It's a great little place full of funky old ruins and the old Stralight theatre - now a great reaturant/bar/meeting place. The town mercantile with a huge porch full of intersting characters and impromptu music from someone sitting out and stiking up a toon on the banjo! It's so peaceful here! We just whiled away the evening sat on Cynta's porch star-gazing - and boy can you see the stars in a place like this?! There's just no light pollution - the sky just doesn't seem big enough for all these stars!